Alphabear was suggested to me by my son. He thought I would find the combination of word game and teddy bears irresistible. I did! In Alphabear, you spell words by selecting letters on a grid. When you use letters that are next to each other, bears appear! The more letters you use in an area, the bigger the bear gets, and the more points you earn. Perform well enough, and you might just a win a bear of your own to keep forever. Bears that you win can be used as powerups in future games! They increase the points you earn for using certain letters or spelling certain words, extend your timer, increase or decrease the frequency with which letters appear, and more! I’m always impressed when a game has clear navigation built into it. As soon as you open Alphabear, there’s a quick tutorial explaining what to do. 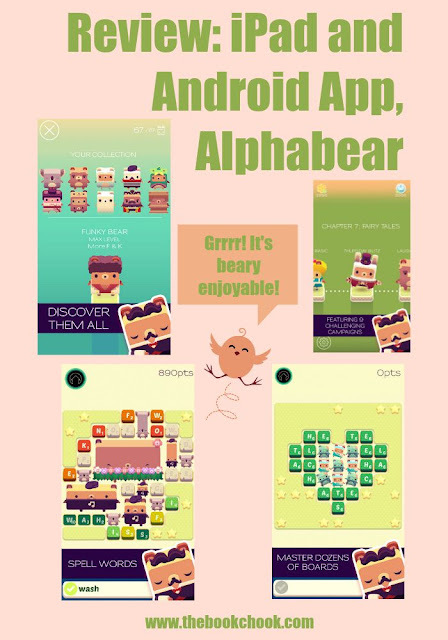 Tapping on letters to spell out words is not a new concept in gaming, but Alphabear has fun extra gaming and social elements built in to make it appeal to a wider range of players. While the word play is most important to me, the art work is very appealing too, with a lovely palette of colours. The bears are very cute, growling periodically and expanding in size as you build words from nearby letters. There are all sorts of engaging features built in to the gameplay, not least of which is the generation of shareable images of bears and sentences that include words you’ve created in the game (see images below.) I also love the idea of being able to collect different bears, each with her/his own powers. The fact that unused letters can turn to stone works against my preferred tortoise-like pace, but I guess every game needs a problem! The game is free. However, there are in-app purchases. 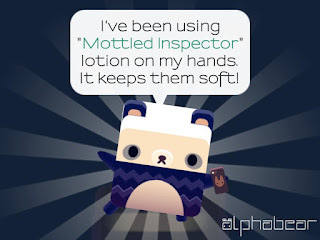 As I believe the main target audience for Alphabear is teens and adults, this is not as much of a problem as if the game had been aimed at primary aged kids. (Most Year 5/6 kids could probably make words from the supplied letter tiles anyway, and I think this would make an excellent choice for a FAMILY game where parents and kids can collaborate, with parents thus supervising any purchases.) There are apparently games within Alphabear you can only play if you purchase them with game coins that you buy with real money. My personal preference is toward games that let you try for free, then pay outright if you want to have access to more levels or content. So far I haven’t needed to buy anything in Alphabear with money, but I admit this is a question mark in my mind for my future playing of the game. If you like word games and have an iPad or Android device, do check out Alphabear!